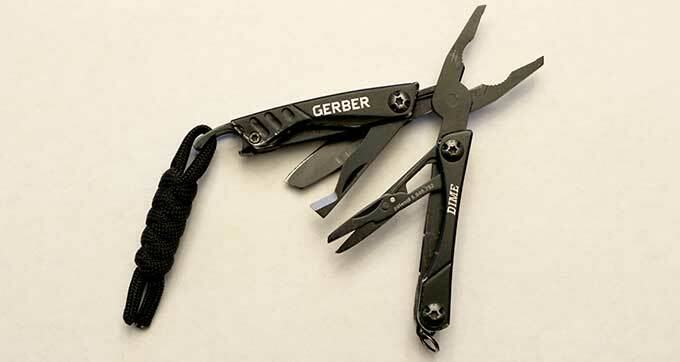 The Gerber Dime Multi-Tool has become and item I carry everyday. At times I carry bigger multi-tools, but even then, everyday I always have my Gerber Dime with me. The size of the tool is just over 2 inches when folded up so it fits comfortably in the watch pocket of my jeans. Because of this size you will find you always can carry it with you. Light enough to carry even with dress pants on. My daughter has a Dime attached to her key chain and carries it comfortably each day. There are 10 tools in total. The small set of pliers and the special shaped package opener are the tools I find most often used. The small knife is just big enough to do the light duty work of small cutting jobs. The package opener is a must for those blister packs from the store you need immediate access to. The small set of tweezers are tucked nicely into the tool and come in very handy for those slivers. 10 Tools Included: Needle Nose Spring-loaded Pliers, Wire Cutter, Fine Edge Blade, Retail Packaging Opener, Scissors, Medium Flat Driver, Crosshead Driver, Bottle Opener, Tweezers & File Given the size, low cost, and usefulness I find this an indispensable tool to carry each day. On the rare days I forget to put into my pocket during the past several years I really miss it.